I will update and add some reviews as I go along, but I figured that having these in one place would be the easiest way to organize them. Post by post seemed good for new info, but not as easy to get back to. Do you have any prenatal favorites?? I’d love to hear them! I had good intentions of updating on vacation. I thought I had a coupon for free wifi, and if that didn’t work, surely 3G coverage! Neither was the case at most points! But I had a great time! I’ll spare the activities recap, and hit the workouts! Thursday, I did wake up at 3am (2am Chicago time!) and did a TurboFire video…Fire 45 EZ. Friday, I was able to go to the gym with a friend for free! I lifted weights there, sticking to my usual workout. Saturday, I met a friend for a ride on the elliptical in the hotel gym. Sunday, I rested. But every day, I walked. And walked! I brought a pedometer and said “I forgot to use my pedometer today” every evening. I also ate tasty Chicago food and delicious home baked desserts, so all of the activity was definitely necessary. I wouldn’t change a thing, other than having a stocked kitchen when I returned home! Must make it to the food store. I wish I could have taken today off to recover and run errands, but it was back to work for me. Off to check off my to do list for the evening and go to the pool for some exercise! My day job has been the busiest and most challenging ever since January 2012. Not the worst thing, but justifying taking a vacation has been tough. I’ve taken some half days (mostly for doctor visits) and one other day. So even though this is only two days off, I’m super excited! I’m heading to Chicago in the early morning. Hopefully I’ll wake up in time to workout (3am!) for a little pre-flight TurboFire. I like to get in a workout before flying so I’m less antsy. I’m setting two alarms just in case! At least part of it, and my story hasn’t ended yet. I am a work in progress, and hope to never reach an end! I was overweight/obese for a good portion of my life. My highest weight was before I had a scale, but no matter the number I was also unhappy with just about everything. I started to workout consistently in December of 2000, joining a gym near my work. I started going in the mornings when it was slow and would workout on some cardio equipment and hit the same weight machines (the ones I could figure out how to use on my own) a few times a week. It was alright, but not exciting or a very good plan. Soon, I started taking classes. Kickboxing, yoga, sculpting…I’d try almost anything. I started seeing results, made some friends, and was having a blast! Kickboxing and yoga were my favorites then. I’d start lifting more weights in a few years. I gained confidence through my workouts and was able to make some other changes to increase my happiness! Eventually in 2004, the gym and I had to go our separate ways. I was studying for actuarial exams and it was tough to go to the gym near work. Bring on the Beachbody! A friend of mine had been doing Turbo Jam and loved it. I bought it quickly and was also hooked! I soon had both the base package and the Fat Burning Elite package. It was around this time that I also started eating healthier. What a difference! I had lost about 30lbs in a bit over 3 years but was now losing around 5 lbs a month until I got to a much healthier weight, but about 15 lbs above goal. I was also around the same weight when I found out I was pregnant…work in progress always! 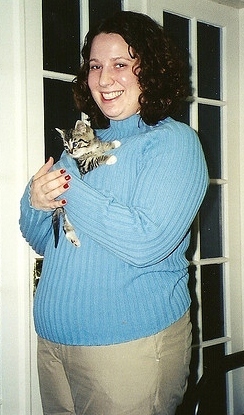 I was my lowest weight in 2008 for our wedding. By then I was lifting weights several times a week, having seen a personal trainer and using New Rules of Lifting for Women. Weights are great!! I maintained about 5lbs above that until we moved into our house in 2009. We had a few weeks without a place to live, which meant without a place to prepare food and without a schedule. When we moved in, it was still tough to prepare food as our kitchen was in shambles. Within about 3 months, I put on about 20 lbs! Back to getting it off again! I went back to Beachbody, working on TurboFire and then ChaLEAN Extreme (love those weights). I also started doing hot yoga more often, another love. Now, in 2012, I start a new weight chapter! In case you think I’m Chalene Johnson obsessed (well, I may be), I’ve also tried Hip Hop Abs, Yoga Booty Ballet and P90X but I haven’t done those programs fully. I’m looking forward to new challenges and adding to my story! Here’s to what comes next! When I found out I was expecting, I was training for a half marathon. Scratch that. My first half marathon with the most I’d ever run in a race being 3.5 miles. I had made it to 7 miles! My schedule was focusing on running, leaving weights and other cardio on the lower end. I found I could lift 3x a week or run 3x a week, but not both. A lot of days this was split between the morning and evening. I doubt I’ll get back to a similar schedule with a baby, but I did enjoy all of this. It was a good, healthy way (as long as I rested when needed of course!) to spend my free time. I like to have a plan for each day so that if I miss a day, it’s okay. I just get back to business the next day! I find that the key to finding the time for exercise is to make it a habit. I don’t ask myself “if” I’ll exercise most days, only when and what. But I didn’t start out like that. Consistency takes time and effort to build, so start now! I think I have time to dye my hair still, so I’m off to do that. It has been a few days too long already! I’ve taken out a day of weights, but there is a weight portion in YBB and the yoga definitely helps tone! I’m using primarily two prenatal programs from yogadownload.com. Both are intermediate, which is what I was looking for in a program. Pre-pregnancy, I did hot yoga about 5 times a week, in addition to other workouts. More on my pre-pregnancy fitness soon!